A lot of trends come and go, but when it comes to the essential oils, they have remained popular for many years. One that holds a lot of interest is lavender oil. So does that make the Majestic Pure Lavender Oil a good choice? Majestic Pure Lavender Oil is a blend of two types of lavender oil. Which are Lavandula Augustifolia which comes from Bulgaria. Then the second oil is Lavandula Hybrida from France. In addition to this, the oil used in this product is classed as a therapeutic grade. The producers of the product claim that the oils in the Majestic Pure Lavender Oil are extracted completely through steam distillation. It is 100% natural. The main use of this oil is for external use only. The hype for Majestic Pure Lavender Oil is the exceptional quality of this oil. There are plenty of brands available, but if you want the true benefits of this particular oil, then you need to invest in a good brand like this one. The cost for Majestic Pure Lavender Oil is $21.50 for a four fluid ounce bottle. The commitment for Majestic Pure Lavender Oil is the same as what should be applied for the use of any of these types of oils. Using them exactly as instructed really brings the best benefits. The other thing to keep in mind is that any of the essential oils can cause an allergic reaction. So before using them a small test should be done first. If you are going to use the Majestic Pure Lavender Oil, then you should have some understanding as to what this type of oil is best used for. Many people use it as an energy booster. But again remember this particular oil is for external use only. Some people are really keen on lavender oil has natural antiseptic properties. For those who want a natural solution for keeping the pesky insects away like the mosquitoes, they will often use a good quality oil like lavender for that purpose. There are different ways you can use the Majestic Pure Lavender Oil for a specific purpose. For example, if you want to use it as a sleep aid, you can add a few drops to your pillow. If you want to enjoy its relaxation benefits, add a few drops to a diffuser. If you want to use it as a massage, then add a few drops to a carrier oil like coconut oil or almond oil. When determining which would be one of the very best lavender oils to comment on we wanted to look at what a whole bunch of other people thought. That it was led us to Majestic Pure Lavender Oil. On Amazon alone, this product has received 5,699 reviews with a 4.1 rating. Out of this number, 71% have given it five stars. For us, that is enough to give it a thumbs up. If you are into aromatherapy, we have a lot of info on this for you to check out. What do you think? 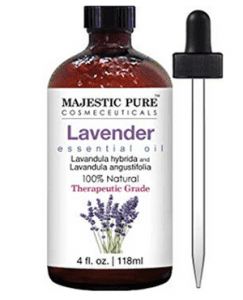 Does the Majestic Pure Lavender Oil work or not?